A recent exhibition in Tallaght, Dublin saw the first outing of two animated graphic scores in collaboration with Killian Redmonk Redmond which will form part of a program of creative music making for primary school children using online resources. The first, Igor the Great, used large coloured buttons as triggers for audio samples which were indicated by dropping pebbles. Below is the full video and a link to the interactive version (requires GoogleChrome and more than 1 player, it's tough!) programmed by Brian-Michael Thornton. The second was a fluxus inspired performance piece where participants wrote instructions on colour coded cards which were randomly distributed. 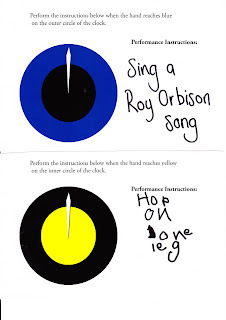 Every ten minutes the clock generated a new combination of coloured segments with the clock hand indicating performance durations to each participant.